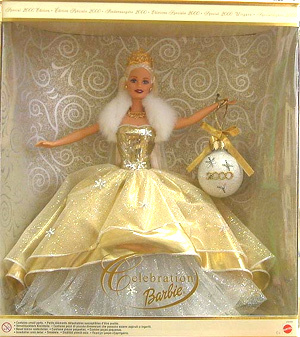 2000 Celebration Barbie - the 2000 Holiday Barbie - was much more festive than the Millennium Princess Holiday doll from 1999! She always looked more like a New Year's doll than a Christmas doll to me, but is quite festive and beautiful. She is wearing a gold gown with a full skirt and a white taffeta underskirt. She has a white fur collar on the shiny gold bodice of the dress. 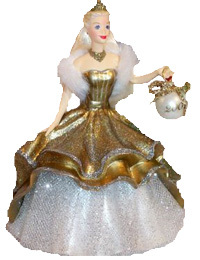 She is holding a small white ornament with silver stars and 2000 on it. She is wearing a gold tiara and her box is also gold. 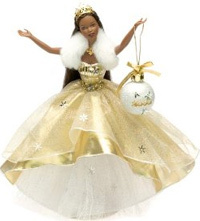 There is also an African American version of this doll and there was a Hallmark Celebration Barbie Ornament in 2000.